Henrik Stenson, of Sweden, loosens up before teeing off on the 12th hole during his bogey free final round of The Players Championship golf tournament at TPC Sawgrass in Ponte Vedra Beach, Fla.
PONTE VEDRA BEACH, Fla. -- Henrik Stenson kept bogeys off his card and clothes on his body, earning fame Sunday for a flawless round of golf and a surprising blowout victory in The Players Championship. Stenson wondered if he would be known best for stripping to his underwear to play out of a water hazard at Doral. This didn't make for great pictures, but it was close to perfection. The 33-year-old Swede shot a 6-under 66 and was the only player without a bogey in the final round on a treacherous TPC Sawgrass course that featured firm, fast conditions rarely seen this side of a major. Trailing by five shots, he took advantage of a swift collapse by Alex Cejka, joined the leaders by chipping in for birdie short of the seventh green and pulled away with a 32 on the back nine when the only drama was the margin of victory. He wound up four shots clear of Ryder Cup teammate Ian Poulter, who shot a 70 for his best finish ever on the PGA Tour. Tiger Woods played in the last group and was never a factor. He was part of the six-way tie that included Stenson, and even as Cejka faltered to a 42 on the front nine, Woods couldn't take advantage. He finished with a 1-over 73 to finish alone in eighth. It was his first top 10 at The Players Championship since he won in 2001, and it kept alive his streak of 16 consecutive stroke-play events in the top 10 worldwide. Stenson, who won for the 10th time in his career worldwide, finished at 12-under 276 and earned $1.71 million. He will move to No. 5 in the world ranking. It was the second-largest comeback at The Players Championship, and matched the largest rally on the Stadium Course. Justin Leonard also came from five shots behind to win in 1998. Cejka lost his lead in four holes after going at the flag from a bunker and watched his ball carom off the bulkhead and into the water. He made only one birdie and shot a 79. John Mallinger (70) and Kevin Na (70) tied for third. They were among a dozen players who had hopes of winning on the back nine, one of the most unpredictable stretches in golf. 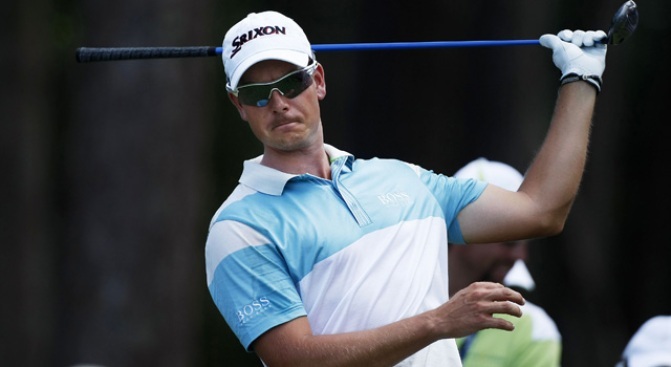 Stenson, a Swede who shows little emotion even when playing in his skivvies, never gave anyone much hope. Davis Love III also played bogey-free for a 64 when he rallied to victory in blustery conditions, although the course was softened by rain. Stenson, playing in the third-to-last group, matched the lowest round of the day, nearly 7.5 strokes better than the field average. He missed only one fairway. The only times he came remotely close to a bogey, he holed par putts of 8 feet on the front nine. Stenson joined the leaders at 7 under with his chip-in birdie from just off the seventh green — Ben Crane, Retief Goosen and Poulter also were atop the board — then took the outright lead with a two-putt from 55 feet on the fringe at the par-5 ninth. "I was thinking this that if I could finish in front of Tiger, that might be good enough," Poulter said. "But I wasn't expecting someone to go out there and shoot 66." Woods pulled his tee shot on the par-5 second into the trees, the ball dropping to the pine straw. He hit his next shot into the water and took bogey, then dropped more shots by hitting into the rough on No. 4 and laying up short of the water, and by hitting into a pot bunker at No. 7 that forced him to play out sideways. It was rare to see Woods, decked out in his Sunday red, playing in a final group with nothing at stake over the final holes. The way Stenson was playing, it didn't matter what anyone was doing. He stretched his lead with a pitching wedge into 2½ feet for birdie on the 15th, then two-putted for another birdie on the 16th, taking some of the fear factor from standing on the 17th tee, staring at an island. Once his ball found land, it was over. "I could afford to go bogey-bogey and still win it," Stenson said. "That's always a handy situation to be in." With the victory comes a three-year exemption to the Masters and a five-year exemption on the PGA Tour if he wants it.